On February 29th, the Windows 8 Customer Preview (beta) will be made available to the public for download. 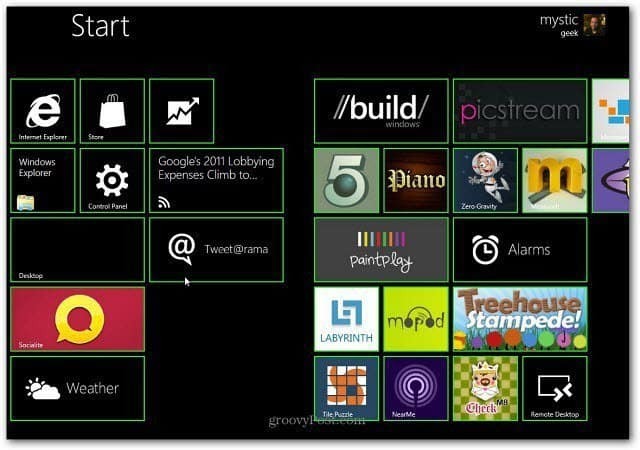 During the BUILD conference in September of last year, Microsoft released the Windows 8 Developer Preview. We’re very excited about this release here at groovyPost. You’ll be able to run it on a touch screen computer such as the Dell Inspiron Duo, a Virtual Machine or a test PC. We don’t recommend you start using this on your main production system though. If you plan on testing out Windows 8 Customer Preview, make sure and check out the Windows 8 articles we already have ready to get you started. What we want to know is, will you download and test the Customer Preview? Cast your vote and leave a comment below. I have just a single PC so no plans to upgrade. I need my home system to be stable. Will probably wait for my new PC with Windows 8 pre-installed. Absolutely will download it the second it’s available. So we can show you everything it has has to offer… the good and the bad. Nah, I like the stability of tested operating system. Live beta testing but not when i have to depend on the system to actually get work done. I have it running on a virtualbox. It still has yet to “wow” me, but I might hack my Kindle and install it there or on another touch device. Yeah I have the Developer Preview running now on a Dell Inspiron Duo and it runs really slick. Also in a VM. I installed it on a spare desktop a while ago and it runs really slick. If you’re a desktop user and concerned about the whole “no start menu” thing, just follow this registry hack…I imagine it will work on the Customer Preview as well…. Totally and immediately. For testing. Not until it goes through a few revs post release will it go on my primary system. I was sur[rised at how much like I like the tiled interface in DP. I am starting to think more seriously of windows phone 7.5 and 8 as a result. Maybe that is the point! None for me, thanks. I am currently running Win7 Ultimate 64bit and it’s working fine. If it ain’t broke I’m not going to fix it. Already running Win 8 Developer Preview and I like what I see. Took me a couple of hours to get around the basics and its so easy to install. I installed in on a spare PC and it runs with no errors or bugs so far and I’ve been testing my software and only my Brother printer software needed Windows 7 compatibiliy mode. Also it ran a 16 bit app with no problems at all after asking me if I wished to enable 16 bit to install the app. Absolutely no problems at all otherwise and the PC I’m running it on is a few years old now and running the preveiw in thriple boot mode with Win 7 and Vista. Yep the minute its available. I have the developer preview and didn’t care for it, so hope the customer preview is better. Will be running dual boot Win 7/ Win 8 CP to test fully. I’ve been using the Win8 CP for a week and now reverts back to Win 7. Totally crap although it seems to be low on resources but I dont want any ‘eye-candy’, but performance!